The partnership enables ITC to deepen its network in Europe and expand attendance of insurance leaders from around the world. Over the past few years, ITC has proven to be one of the most important events in the industry. InsureTech Connect, the largest insurance industry event covering innovation and transformation, returns this fall, October 2nd and 3rd, 2018, to the MGM Grand Las Vegas Hotel and Casino. ITC brings together technology entrepreneurs, investors, and insurance executives from around the world. For the 2018 conference, ITC is excited to announce a partnership with Maschmeyer Group Ventures (MGV), the investment entity of the German investment company Maschmeyer Group, to expand the conference’s European involvement by leveraging the expansive network of MGV’s founder, Carsten Maschmeyer. The partnership enables ITC to deepen its network in Europe through MGV-founder Carsten Maschmeyer. Carsten has a broad network across the European insurance sector and is one of Germany´s leading investors. On October 1st, Carsten along with the MGV team will host a pre-conference workshop to facilitate connections between European and U.S investors, founders, and insurance executives. Carsten will also join the group of industry professionals speaking at the conference with an address covering his experiences in the insurance industry and lessons learned from helping new financial technology companies grow. Carsten Maschmeyer: “Over the past few years, ITC has proven to be one of the most important events in the industry. Each time I have attended the conference I have been impressed by the quality of the attendees and have walked away with meaningful new relationships and a better understanding of change coming to the industry. I am proud to support ITC and look forward to expanding its reach with my European InsureTech Network." Caribou Honig and Jay Weintraub, Co-Founders of ITC: "MGV is an ideal partner for ITC 2018. InsureTech is global in character, and ensuring attendance of insurance leaders from around the world is a key priority for this conference. We are excited to have the support of Maschmeyer Group, and of Carsten himself, to make this a great experience for executives, entrepreneurs and investors from throughout Europe. This partnership affirms ITC as the leading, global InsureTech conference." InsureTech Connect is the world’s largest insurtech event, offering unparalleled access to the largest and most comprehensive gathering of tech entrepreneurs, investors and insurance industry incumbents from across the globe. Founded by Jay Weintraub and Caribou Honig in 2016, ITC has grown to more than 6,000 attendees, hosting 200 speakers, and representing 45+ countries worldwide. InsureTech Connect 2018, presented by Oliver Wyman, will be held October 2-3 at MGM Grand Las Vegas Hotel and Casino. MGV is a seed-stage venture capital firm based in San Francisco investing in early stage companies with high growth potential. MGV launched in October of 2017 and is the U.S. based investment vehicle of the Maschmeyer Group. 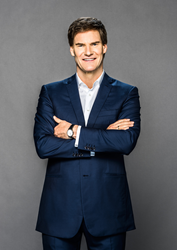 Carsten is a German businessman, investor, speaker, author and TV-investor in the German version of the reality television series Shark Tank and in his latest television show "Start up: Who will be Germany's next best Founder?". Carsten is the founder and CEO of the Maschmeyer Group, an umbrella for his three investment vehicles: Seed+Speed Ventures (Berlin, Germany), ALSTIN Capital (Munich, Germany) and MGV | Maschmeyer Group Ventures (San Francisco, USA).